Barrow’s sea ice has borne a number of pretty severe insults over the past week. First, an Arctic heatwave sent Alaskan temperatures soaring to 98 degrees (F) in the interior, the highest temperatures ever recorded for the state. This heat pulse extended far above the Arctic Circle pushing temperatures at Barrow as high as 65 degrees (F) even as flows of warm water flooded into the Chukchi Sea from Alaska’s baked center. These high temperatures spurred an early break-up of Barrow sea ice last week. A break up that proceeded about three weeks ahead of schedule. Then, an ice-melting rain settled in, pelting the sea ice over the past three days. Now the offshore ice is simply gone. As you can see in the image above, huge sections of near-shore ice are melted and broken with large areas dominated by dark Arctic water. But offshore is were the greater effects have occurred. Over the past 24 hours, the off-shore ice has shrunk back and now only open ocean is visible on the horizon. Ice break-up at Barrow occurs when off-shore ice at distances greater than 200 meters from shore begins to move. This event usually occurs on about July 8th. This year it happened on June 20th. Now, less than a week later, the ice that first broke has disappeared. It will take a little longer for the near-shore ice to melt out. But the most important ice off Barrow — the sea ice — is now departing, retreating into a pack that is rapidly receding from the Chukchi Sea. Note the ongoing parallel motion to shore and then the lifting away of sea ice during the last sequence. These radar shots were taken on June 24. So final recession of sea ice occurred only four days after break-up. 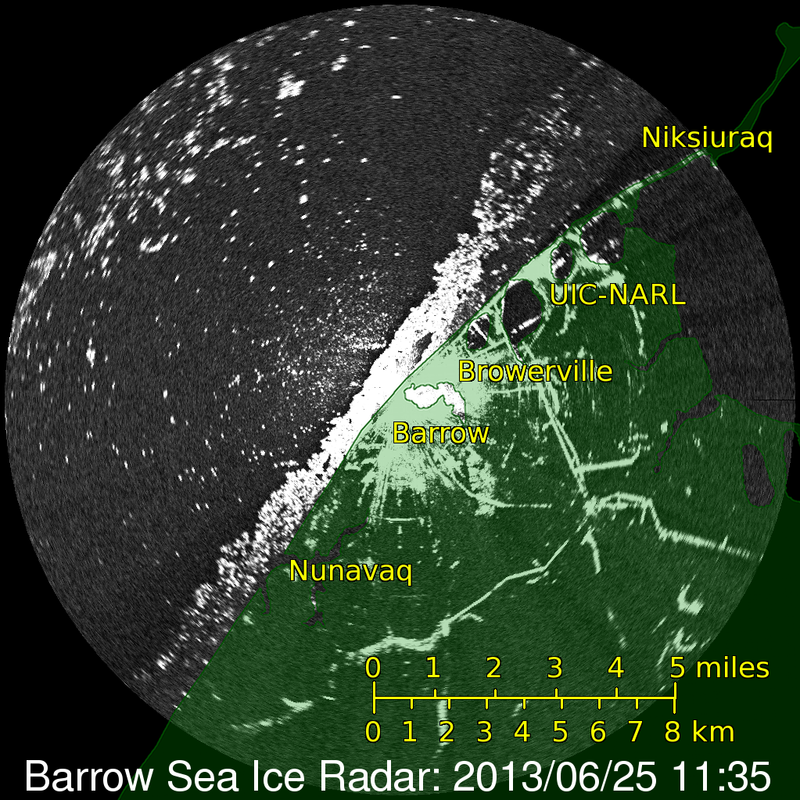 Today’s radar shots from Barrow show only small chunks of sea ice remaining from a once-large pack. 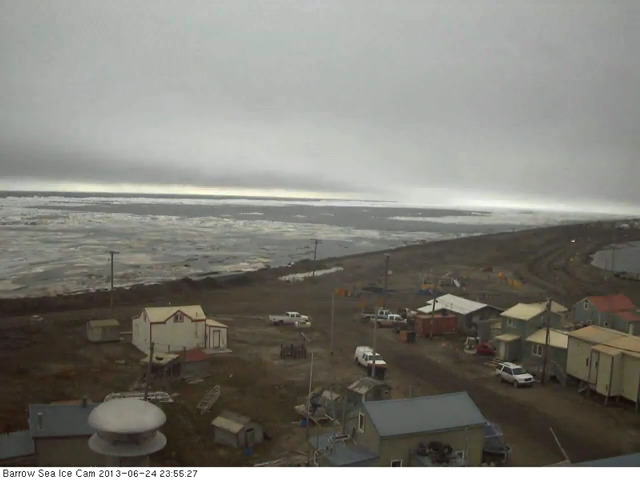 We can now say farewell to significant sea ice at Barrow, Alaska for the rest of this summer. Melt will now begin to proceed past the Chukchi Sea and into the Beaufort and East Siberian. This will likely have significant impacts once Beaufort ice begins to break as a Gyre in the center of the Sea begins to increase ice mobility and melt. Already, anchors have been weakened by both rapid melt in the Chukchi and by a large pulse of warm floodwater flowing out of Alberta via the Mackenzie Delta. This pulse of water is a direct result this week’s Canadian floods. So we’ll have to see what impact these warm flood waters have on the shore area of the Beaufort over the coming week. Last of all, it is worth mentioning that this year’s Persistent Arctic Cyclone has tended to push more ice into the Beaufort. Over past years, the Beaufort has been much more vulnerable to melt come late July through mid-September. With early melt rapidly proceeding from the Chukchi and with areas in Canada and Alaska vulnerable to floods and heatwaves, this critical region of buffering ice will increasingly come into play as melt season progresses. The new dynamic of a PAC hollowing out the central ice as Beaufort melt and ice motion begin to crank up raise the potential for a number of volatile outcomes. So eyes will shift to the Beaufort as these new potentials emerge. Over the past year, we’ve now experienced three major heatwaves north of the Arctic Circle. Greenland melted under a freakish blanket of heat-trapping clouds, Scandinavia saw an early June heatwave that sent temperatures into the 80s, 30 to 40 degrees hotter than normal, and just this week Alaska experienced record heat that sent temperatures there into the upper 90s, probably the hottest temperatures ever recorded there. Now, a combination of new research reveals changes to the Jet Stream that enable warm air to enter the Arctic even as a thickening atmosphere sets in place conditions where powerful ‘heat domes’ are more likely to form. Our story begins in Greenland during July of 2012. At that time, a powerful blocking pattern enabled a strong high pressure system to form over that frozen land. An upward swing in the jet stream pumped ever-warmer air over its vast ice sheets. Finally, record temperatures were reached both along the coast-line and even at the center of its three kilometer high glaciers. 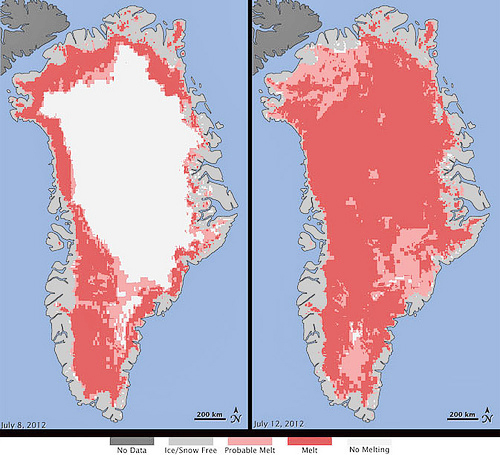 Temperatures in the Greenland interior rocketed to 60 degrees. Within only a few days, almost the entire ice sheet was experiencing some kind of melt. A record 90% of the ice sheet succumbed, far out-pacing the previous record of 52 percent set just two years before in 2010. Draped over top of this melt was a freakish layer of low clouds. Clouds are, generally, thought to block heat from the sun. But, in this case, it appeared the clouds had locked heat in, recirculating it and keeping it close to the ice, forming a heat-trapping blanket over Greenland. 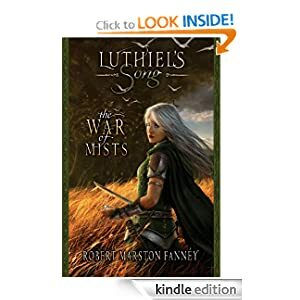 Far above this low cloud layer, the atmosphere was growing ever thicker. A towering high pressure system known as a heat dome was sucking in the warmer air from around and beneath it, trapping it in a denser and denser layer. From the south, a long-period, very persistent blocking pattern fed warmer, moister air into this heat dome. Meanwhile, the sea ice, which had tended to insulate Greenland from direct assaults of heat in the past, had retreated far behind its usual summer lines of defense. As a result, Greenland baked. In the media, contrarians did their best to down-play what was clearly a catastrophic event. They retreated to their usual ‘natural variability’ claims. But the closest event bearing any similarity to the 2012 event happened in the 19th Century and it didn’t occur at the end of a long string of worsening melt. Context formed a mire which contrarians were having ever-greater difficulties extracting themselves from. But context was coming back to haunt us yet again as June 2013 rolled around. This time, another blocking pattern had emerged — creating a strange whirl in the Jet Stream. The path of atmospheric current followed a course much like a river bends through a marsh. It coiled, snake-like, bending back on itself, forming cut off circles. This punch of colder air extended from Greenland all the way into central Europe. This extrusion of Arctic atmosphere resulted in one of the most extreme winter/spring periods Europe has ever experienced. Record snows were followed by record floods. By June, some water gauges on Europe’s largest rivers recorded the highest levels since the 1500s. It was the third 1,000 year flood to occur within the last 13 years. But the colder, stormier air didn’t penetrate any deeper than Eastern Europe. There, it doubled back on itself, heading up and back into the North Atlantic. In front of this coil of air, this blocking pattern that had persisted over Europe since winter, rose a burst of heat. This pulse flowed into Scandinavia where it stagnated. Heat pooled in this region and, in a few days, records were being shattered across such improbable Arctic regions as Finland. 80 degree temperatures reigned in a region that usually experienced 40 degree weather this time of year. In about a week, the Scandinavian Heat Wave had backed off, but temperatures remained well above average into mid-June. But heat was, again, about to re-emerge just two weeks later in another improbable region of the Arctic. This time, a blocking high pressure system that had created a high amplitude wave in the Jet Stream over the Pacific Ocean just south of Alaska and west of British Columbia was about to preform an exotic trick. Alaska, resting just north of this blocking ridge had lain beneath a front of cold air for much of May. So while areas of California, Nevada, Arizona, Washington, Oregon, and British Columbia were experiencing abnormally warm conditions, Alaska experienced temperatures that had plunged into record low territory for many cities. Contrarians proclaimed the end of global warming for Alaska. But the heat was coming and they only had to wait one month. By June, the blocking pattern which had kept cold air to the north and warmer air to the south began to edge into Alaska. Temperatures flipped from the 20s to the 70s for many regions. Barrow, which had experienced a warmer than average winter and spring, saw temperatures rise into what, for it, was the balmy 40s. But this pulse of warmer than average air wasn’t finished. The current of Jet Stream cut off, giving this warm high pressure system an encapsulating band of winds. Conditions were now right for the formation of another heat dome. And form it did. By Monday of this week, temperatures had rocketed to 98 degrees in some places of the Alaska interior, possibly breaking the all-time record high for the hottest temperature ever recorded, at any time, in Alaska. Today, temperatures for Barrow, one of the coldest cities on Earth, are projected to hit 70 degrees, about 31 degrees above the average high for this time of year. Greenland, Scandinavia, Alaska, three record heat waves above the Arctic Circle all in the last year. What in the world had happened to the weather? A number of climate scientists and meteorologists have begun to grapple with the new, unstable regime of weather gripping the Arctic. These include Dr. Jennifer Francis of Rutgers University, Stu Ostro of The Weather Channel, and Dr. Edward Hanna of the University of Sheffield. Dr. Francis, last year, provided compelling scientific evidence that the erosion of Arctic sea ice and the rapid melt of Northern Hemisphere snow cover during the summer time resulted in changes to the Jet Stream. This erosion of sea ice and land snow resulted in less of the Arctic’s cold air being trapped within the Arctic. It also resulted in more floods of warmer air coming up from the south. This north-south motion of air masses had the net effect of reducing the temperature difference between the Arctic and the mid-lattitudes. 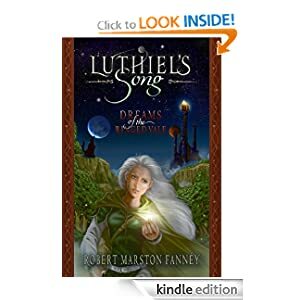 As a result, the river of air surrounding the pole known as the Jet Stream began to slow down, forming large dips and bulges. As these dips formed and the air slowed, the Jet Stream had more of a tendency to become stuck. This sticking in place created ‘blocking patterns’ in which a given set of weather was more likely to persist over long periods of time. Recent examples of these blocking patterns and their related weather include Europe’s extreme winter and spring of 2012-2013 and the 2012 US Heatwave and related 2012-2013 drought. Further, without the collision of Arctic and Tropical air masses enabled by a massive dip and up-swing in the polar Jet Stream near the US East Coast, it is doubtful that the Hybrid Superstom Sandy would have ever formed. Dr. Francis notes an increased frequency of such extreme, blocking pattern spawned, events and the picture she paints provides us with a much better understanding of how climate change is impacting our weather. And the result is some rather alarming consequences. Our analysis allows us to assess the relative contributions of these two key influences to both the extreme melt event and ongoing climate change. In 2012, as in recent warm summers since 2007, a blocking high pressure feature, associated with negative NAO conditions, was present in the mid-troposphere over Greenland for much of the summer. This circulation pattern advected relatively warm southerly winds over the western flank of the ice sheet, forming a ‘heat dome’ over Greenland that led to the widespread surface melting. Dr. Hanna’s paper pointed out the movement of warmer air over Greenland via a strong blocking pattern in the Jet Stream and the building up of a powerful ‘heat dome’ and blocking high pressure system over the ice sheets. Hanna also added the contribution that lower level clouds enhanced, rather than inhibited, melt. Together, this research points toward how receding sea ice and a warming climate are setting in place conditions that are causing these Arctic heat waves. And the recent heatwaves in Greenland, Scandinavia, and Alaska provide excellent illustrations of the kind of events we can expect with greater frequency in the future.